Why serum? Ever since we moved to LA from Chicago, I’ve been using serum. Partly because I am into my 30’s and thinking about the appearance of fine lines, wrinkles, and wanting better skin and improving radiance. I recently mentioned to my best friend about using serum and to my shock, she said she doesn’t use serum. I told her, you can’t afford not to and introduced her to Clarins’ Double Serum. It’s a bio-inspired, anti-aging serum, with a two-phase hydric (water soluble) and lipidic formula that, for the first time decodes the language of youth. Does that last sentence catch your attention? 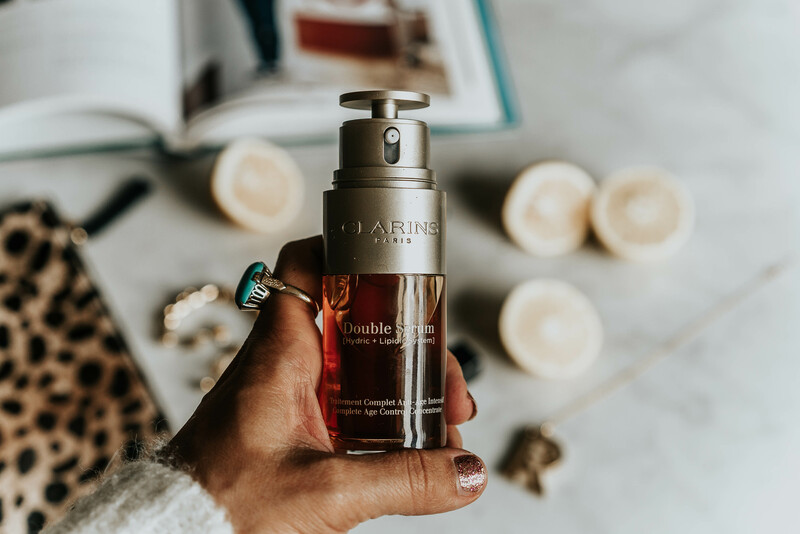 If you’re not familiar with bio-inspired lipidic formula, that’s scientific for “reduces the appearance of pores, improves radiance, evens skin tone, firms and visibly reduces the look of fine lines and wrinkles.” It can be used morning or evening after cleansing your skin. How do I apply it, you ask? Apply a small amount into the palm of your hand, warm between hands before gently pressing into your skin applying on you face, neck, and décolleté. Keep in mind, it takes 28 days to see the full effects of your serum. What do you think, do you use serum?